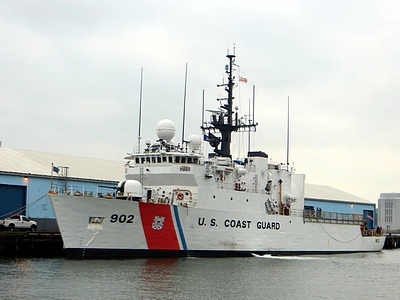 The U.S. Coast Guard cutter Tampa, WMEC 902, named for my old home city, was docked at Pier 7, Brooklyn, my adopted home, last weekend. I shot this photo from Pier 6 in Brooklyn Bridge Park. Tampa has come to Brooklyn in another respect: you can now get a good Cuban sandwich (which may have been invented in Tampa) at the Brooklyn Heights Wine Bar. And, starting in 2014, when the Islanders move from Nassau Coliseum to Barclays Center, the Lightning will be making visits here. 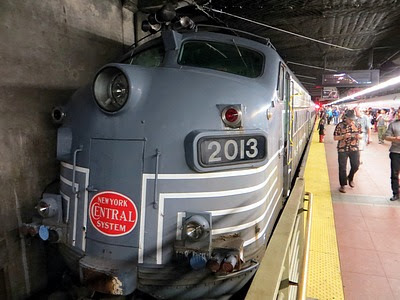 Grand Central Terminal recently celebrated its one hundredth birthday. As part of the centennial celebration, this weekend there was the "Parade of Trains," an exhibit of past and present day rolling stock that has visited the terminal over the years. Your correspondent couldn't miss this. 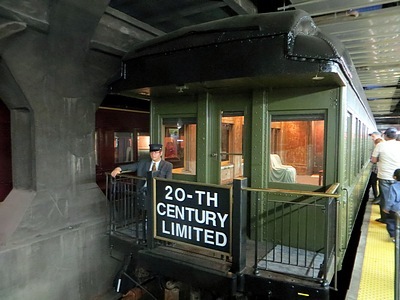 Entering the exhibit, on the left was Tonawanda Valley, a Pullman observation and sleeping lounge car built in 1928 that served as the tail-end car for the Twentieth Century Limited, the New York Central's premier New York to Chicago train, in the late 1920s and '30s. Across the platform from Tonawanda Valley was Metro-North Railroad's (MNRR is one of three commuter railroads--the others are the Long Island, also part of the Metropolitan Transit Authority, and New Jersey Transit--serving New York City) Engine Number 402, built for work train service and using "co-gen" power--see here. 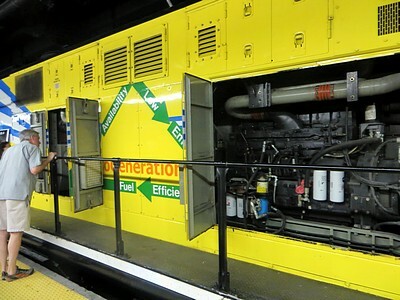 Here's a look at the guts of co-gen power, in a sister loco parked behind 402. 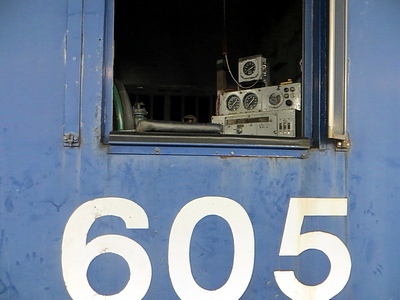 Metro-North's 605 is an ALCO RS-3 type, built in 1952. "RS" meant "Road Switcher," indicating that the loco could be used for shunting cars in yards or for light road service. Metro-North may have used it as a switcher or on work trains, or both. Here is a look at the instruments inside 605's cab. Here is a look at 605 from the front end. A handsome locomotive, in my opinion. 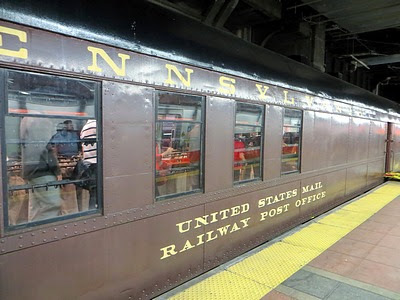 I may well have seen this Railway Post Office ("RPO") with the markings of the Pennsylvania Railroad some time during my childhood when visiting my grandmother in Tyrone, Pennsylvania, on the Pennsy's then four track main line. RPOs would pick up mail at stations along the way, and the mail would be sorted by Postal Service personnel in the car for delivery to other places further along the train's route. 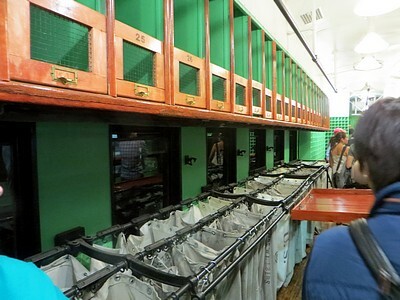 Here's a view inside the RPO, showing the bags in which the mail was collected or distributed. 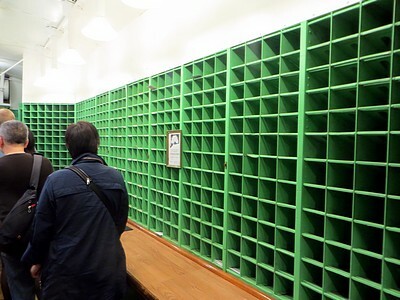 Another interior RPO view, showing the cubbyholes into which the mail was sorted. 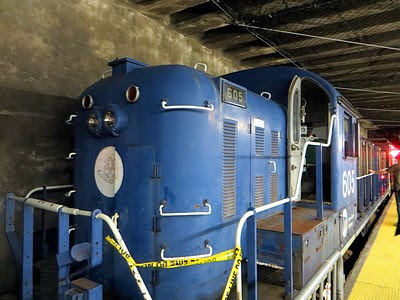 For some time until the early 2000s Metro-North used General Motors Electro-Motive Division's ("EMD") FP-9 type diesel locomotives on commuter trains that ranged into non-electrified territory. Some of these bore "heritage" paint schemes, i.e. those of railroads that ran the commuter services before they were taken over by Metro-North. 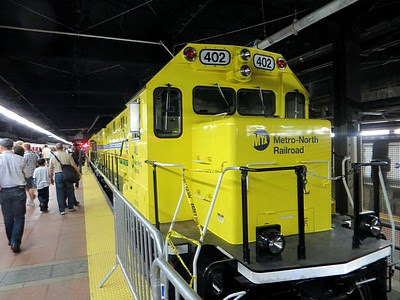 For example, 2013 wears the colors of the New York Central. Others (actually similar FL-9s that were equipped to run on third rail electric where available) wore the bolder livery of the New Haven. While Tonawanda Valley served as an observation car for the prewar Twentieth Century Limited, the streamlined Hickory Creek was built in 1947 for the postwar version of the Central's best known train. 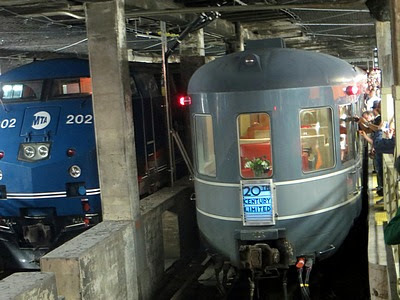 On the left, locomotive number 202 is a General Electric Genesis, a type that has replaced the EMD FP-9s on Metro-North.